Would You Want a Robot Paparazzo for Your Home? Every step you take, every move you make, this robot is watching you — but it's not as creepy as it sounds. A 14-pound companion robot named Kuri can now capture candid photos of moments you might not otherwise memorialize. Inspired by a toddler’s view of the world, the tiny bot takes shots from unique angles, learns which photos you like best, then records more of the same. But don’t worry, you can also teach it what not to record. Introducing Kuri: Does Your Life Need a Home Robot? "Kuri Vision just lets Kuri do her thing," said Mike Beebe, the CEO of Mayfield Robotics, the tech firm behind the bot. While Beebe used the pronoun "she," the robot is genderless, according to the company. "She busts around, looks at you, sees what's happening and at the end of the day, she says, here are eight five-second little bits of video that you may not have even been in the room for but I think they're awesome," Beebe said. Those moments are captured from Kuri's unique 20-inch-tall vantage point. Beebe told NBC News that part of the inspiration for Kuri Vision came from his 4-year-old son, Thomas, who loves snapping photos of his 18-month old brother, Sam. Letting Thomas run wild with a digital camera yielded some unique photos from a toddler's perspective, but the ones he took of his brother turned out to be keepers. He took "one of the best pictures we have of Sam. It's never a perspective we would have had and if it was us taking the photo, we never would have had that," Beebe said. "So we started to play with this idea." Related: As Robots Learn to Become More Human, Are We More Robotic? Through machine learning, the app sorts the moments by who's in them, what's happening, and the time of day. The more photos you like, the more the app learns what kinds of moments you want to see, Beebe said. 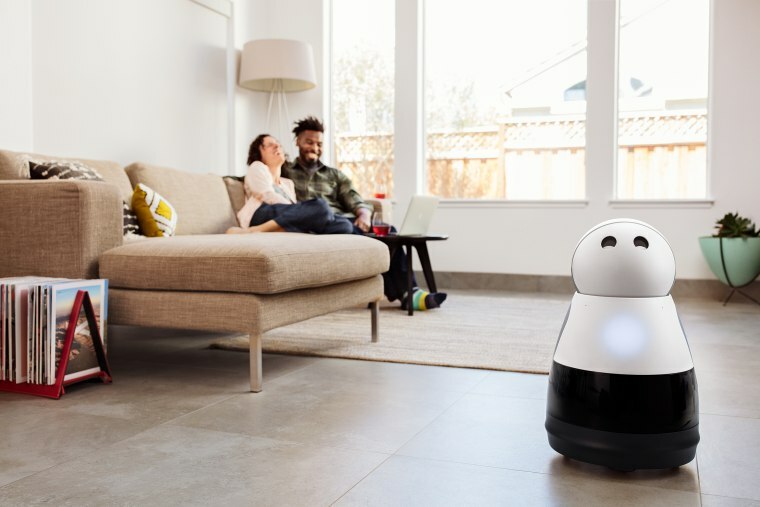 Having Kuri Vision can be cute when it's taking photos of Sam playing or a pet's antics, but the idea of welcoming a robot paparazzo into your home can also seem a little disconcerting. That's where the controls come in, allowing you to designate certain times of day or only certain rooms where Kuri can record in your home. "You are asking Kuri to be a member of your family," Beebe said. "Since she runs around inside your house, control has to go with that for people to feel comfortable. You want the smile to be there." The app is intuitive, making it easy to like clips you want to keep and delete the ones you don't. Only you see your moments, Beebe said. However, if there's something you like and want to share, the app makes it easy to post the clips on your social network.